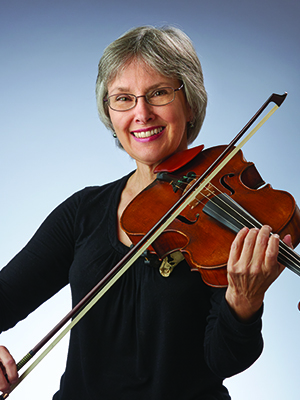 Terry Langdon joined the Indianapolis Symphony Orchestra in 1979, holding the title of associate principal viola until 2002 when she elected to move into the section. Born in New York City, she earned a B.M. from Indiana University and an M.M. from Yale University and has studied with Georges Janzer and Raphael Hillyer. Before coming to Indianapolis, she was principal viola with the Owensboro Symphony and played in the viola sections of the Buffalo Philharmonic, the New Haven Symphony and the Aspen Festival Orchestra. She is a member of the Linden String Quartet and assists the ISO's education programs as an Artist in Schools and a Side by Side section coach. Ms. Langdon is married to a biology professor, and they are the parents of three children. She is active as a volunteer at her church and her children's schools. Knitting, sewing, cooking and running provide additional enjoyable moments for her.